Our friend, Marek, wasn’t happy–in fact he was downright gloomy last Sunday. He and his wife Jessica run the Primrose Hill Book Shop, near where we used to live in North London. He told us there are about 2200 high street bookshops left in Britain today compared with 4,000 in 2005. Five hundred and eighty towns in the UK do not have a bookshop. According to a recent report by the data company, Experion, the rise of internet retailers, the growing popularity of e-readers such as the Kindle and heavy discounting by supermarkets have forced nearly 2,000 bookshops to close over the last six years. Marek and Jessica deserve to be one of the survivors–they give a wonderful service. Order a book from them and they will post it off in double quick time and with a love of books in their hearts. 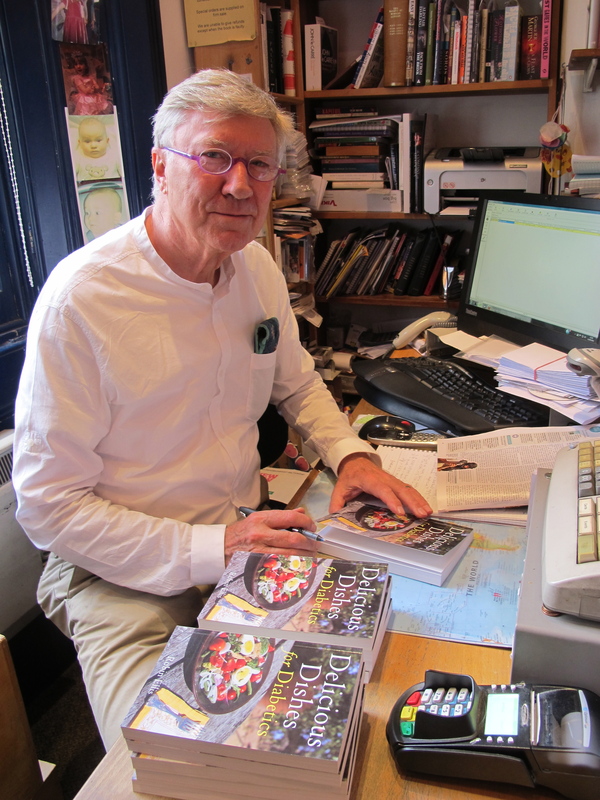 I was there to sign some books for anyone wanting a signed copy: http://www.primrosehillbooks.com/. This Saturday, Sept. 17th, 2011 from 2.30 to about 4.00pm I shall be at Waterstone’s bookshop in Truro, Cornwall to sign copies of Delicious Dishes for Diabetics–see you there?! Welcome back to Cornwall, Robin. I am hoping to get to Truro, tomorrow, but the whole day has turned into something of a logistical nightmare for me ………will do my best. I’m sure it will be a successful session, even without my presence!! I wish! It’s a long hop, skip, and jump from South Carolina in the US to Truro. When you step into the bookshop, you take a deep breath, you breathe in the scent of the paper and ink, musty books, new books each with an aroma that’s so homely. You’re greeted by a fellow lover of books from behind his book and paper ladened desk and told ‘to take your time, shout if you need a hand’. You browse the shelves lifting down all that take your fancy, building a pile of longed for books in your arms, settle in a comfy chair and look through your chosen objects of desire, choose the couple that you really can’t not take home. Sadly replace all those that you have decided will wait until another day, pay the smiling shop owner and take your purchases home to sit and read with a freshly brewed cup of coffee, wondering while you do if the lovely bookshop will still be there when you return for your abandoned yet wanted books. I for one am returning to the world of the small independent bookshop, the small retailer and the friendly service of years ago and leaving behind the supermarkets and the online retail world. 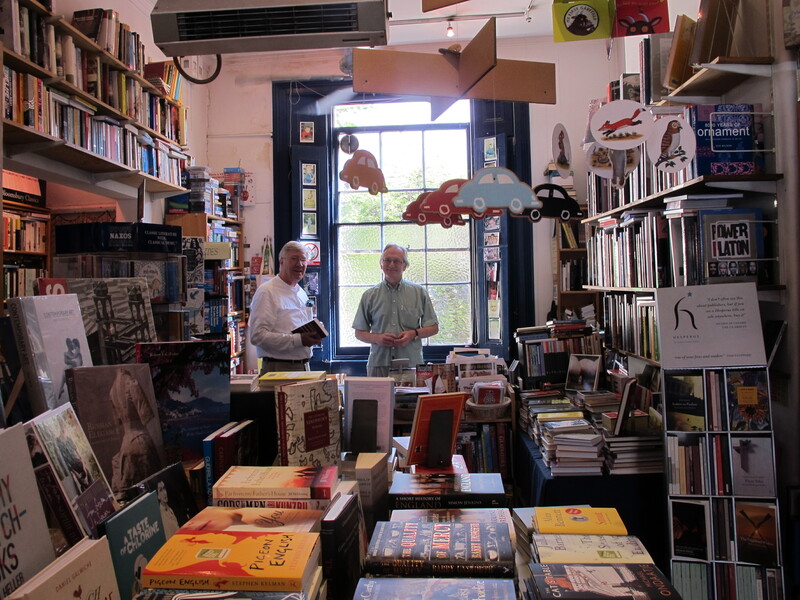 A lovely Blog post highlighting your friends lovely bookshop. Have fun with the signings, I wish I had your signature in mine, but you may have wipe off the spashes of food to get it there, it’s in daily use!! That’s really sad. In Germany there has traditionally been a book price maintenance (some European countries have it too in similiar form) binding the booksellers not to discount (except under very specific conditions). All books must cost the same whether they’re sold over the Internet or at a bookshop. What results has helped small, quality publishers and booksellers. Until now, we have enough bookstores but I’ve heard that many smaller booksellers will sell their stores. They are not economic enough. It is to fear that we will loose more and more the offering of unique and special stores, like in other branches. I hope I could make a small contribution. I have ordered the book last week. I am looking forward for a signed copy. Best wishes and enjoy your stay in lovely Cornwall ! On the button, Martina–thanks for that. I’ve just ordered my book through them this minute and I pray that I get an autographed copy, I wish that I could pop into Cornwall and get it in person. That area of the world is definitely on my bucket list of soon vacations. I understand that your book features dishes for diabetics. I am not, but just wanting to cook and eat healthier is my motivation to try these recipes! Visiting independent bookstores in all my travels is such a delight. I adore them and hope they are not going to disappear, One day I hope to get into Primrose Hill myself, but in the meantime, they can forward this book to me in Texas!! Enjoy the blog very much and wish I had found it sooner. on September 17, 2011 at 5:09 pm | Reply Dianne P.
Oh to meet YOU in person, hoping that YOU do book signings and TV here.